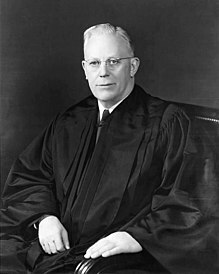 Earl Warren (March 19, 1891 – July 9, 1974) was an American lawyer, judge and politician. He served as Governor of California from 1943 to 1953. Warren ran for Vice-President in 1948 as a Republican, but lost to Alben W. Barkley in a close election. Warren was born in Los Angeles and grew up in Bakersfield before moving to Oakland. He served in World War I. In 1925, he became District Attorney of Alameda County, and later Attorney General of California. In 1953, he became Chief Justice of the United States. He was Chief Justice when the Supreme Court issued Brown v. Board of Education and Miranda vs. Arizona. These two cases were very important civil rights cases in the United States. Warren was also in control of the Warren Commission. It looked into a possible conspiracy in the killing of President Kennedy. Warren retired from the Court in 1969, and died in Washington, D.C., in 1974. This page was last changed on 18 January 2018, at 18:10.